It’s our 10-year anniversary! In this series, we catch up with some of our most beloved Wanderlust teachers over the years. This week: Mary Beth LaRue. Tradition dictates that a 10-year anniversary is celebrated with aluminum; modern norms have ditched the tin for diamonds. As we begin celebrating 10 years of Wanderlust in 2019, we think the diamond is apropos: Over the years, we’ve certainly refined the proverbial lump of mindful coal into what we consider a shining beacon of the promise of wellness for all. It’s been a journey—and there have certainly been plenty of bumps along the road. But one of the things that hasn’t changed (and of which, full disclosure, we’re pretty darn proud!) is our great relationship with world-class teachers. Every year we bring you a roster of renowned talent to help you find your true north. In this series, we’ll highlight some of those teachers who have been with us over the years—and how they look back at their relationship with Wanderlust over the past decade. This week: Mary Beth LaRue. Don’t miss your chance to be a part of this very special 10-Year Anniversary! 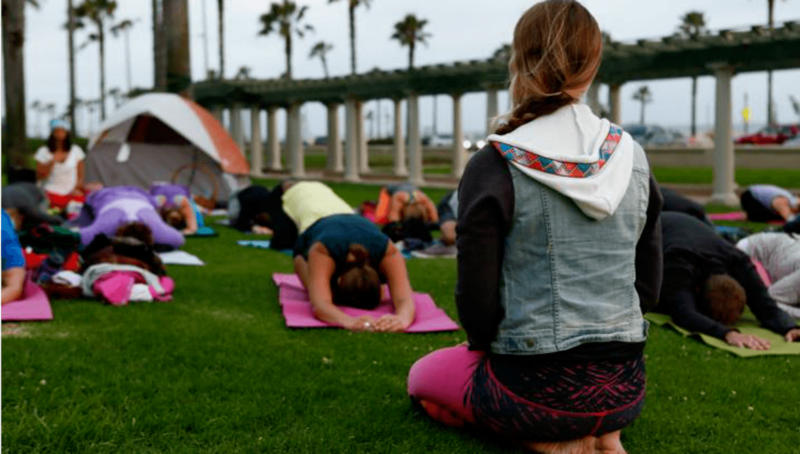 Join the global mindful movement at a Wanderlust event this year. Tell us about your first time at Wanderlust. My first time at Wanderlust was nine years ago. I road-tripped to Tahoe in a Jeep Wrangler and camped near Truckee. I was a blissful, balanced sweaty mess every single day. Practicing with my favorite teachers from all over the world then diving into the lake. Gives me goosebumps to think of that experience and all of the amazing Wanderlust events I’ve been a part of since. You can practice with Mary Beth from the comfort of your living room on Wanderlust TV! What does Wanderlust mean to you? I love a good road trip with an amazing playlist, windows down. I love dirty, backpacker kind of travel, especially in Central America. I love searching for the best cup of coffee in a new city. I love the moment before you walk into something new and visualize what you are about to experience. I’m always wrong and I love that! Wanderlust for me is staying in relationship with life and continually surprised by it. “Bigger Than Your Fear,” about overcoming her fear of public speaking. How has Wanderlust been a part of your journey? Attending the festivals was a huge part of my yoga teaching journey. I drew on that inspiration as I moved forward. I’ve taught at Wanderlust Hollywood. I’ve traveled all around North America teaching at Wanderlust festivals and 108s. I’m so grateful for the amazing students and Wanderlust crew that I’ve met along the way. It’s the people on the ground who make it happen and and who inspire me. Mary Beth is also the co-founder of Rock Your Bliss. She and her business partner, Jacki Carr, will be speaking at Wanderlust Snowshoe in 2019! Just can’t wait? Sign up for their Seven Weeks to Bliss online program, which kicks off February 5. For more information and to sign up, click here.